The Quasar ETC is perfect for extended base camp use when a large storage space will increase your comfort. All this with the same proven reliability as the standard Quasar. 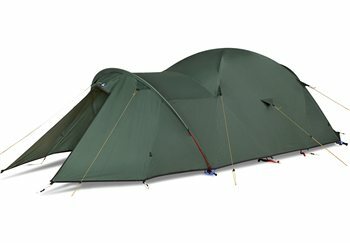 Exactly the same pitching as the Quasar with the same inherent strength, colour coded poles and continuous pole sleeves. The exceptionally strong, geodesic structure benefits from the addition of an extended porch at one end, doubling its length. The extra pole provides support and increased headroom in the porch. The second porch is retained for added versatility and access creating a superb expedition tent for long trips when camps are moved daily. The combination of Watershed Endurance and Waterbloc fabrics provide excellent durability, waterproofing and UV resistance, allowing the Quasar ETC to withstand the same harsh mountain conditions as the Quasar.